Geared toward the type of investors who has dreams of actually owning foreign investments properties. Generally, an endeavor such as this would be full of risks, but Auxo Homes mitigates the risks as much as possible. By purchasing your property through Auxo Homes, you get access to a property that has already been per-analyzed and renovated. Since we buy properties in high volume, we get priority access to the best deals in the market. We make these deals available to you quickly with all tools at your disposal. Entering a new city with the purpose of investing in real estate can be intimidating, if you do not have the rightinformation to make the right decision. With each property, we provide you an assessment package which contains all the relevant information you would want. Auxo Homes purchases it's properties in specific areas showing strong cash flow opportunity and high expectations for appreciation. We do all the homework for you. This includes, but is not limited to, demographic reports of the area, sales trends and past history and a full rental analysis which takes into consideration competitive and comparative properties. Because most of our properties are distress, there can be additional expenses attached to the Title. These expenses may include multiple mortgages, property taxes and condo fees that have been left unpaid. Our team ensures that these issues are cleaned off of the Title so that you can buy with confidence and also include Title insurance with the property. The purchase of a home is, in most cases, the largest financial commitment in an individuals lifetime. Your ownership is authenticated and will be promptly defended against any claims, in court if necessary, at no cost to you, whether a claim is valid or not. A title insurance policy will protect you and your heirs as long as you have an interest in the property. If a valid claim is made against your title as covered by your policy, the title insurance protects you by bearing the cost of settling the claim, in order to protect your title and keep you in possession of your property. Buying a condo is the easy part but making sure everything is in place and having a healthy condo corporation is a must. Auxo Homes provides you with all Homeowners Association documents, annual financial balance sheet, the current year's approved budget, declaration of condominium, frequently asked questions and more. We make sure there is no pending or proposed special assessments to come and we give you all the documentation necessary to make an educated decision. The condition of the properties Auxo Homes purchases varies greatly and renovations are often needed. Our contractors examine the property before the purchase is complete and a team is in place to complete any work necessary as soon as the keys are given to us. Once the work is complete, the property is in great condition and move-in ready. Afraid to run into vacancies with your property? We understand that this is a worry for international buyers. We understand the local market and we go into areas with low vacancy rates. We pre-screen tenants and put them in place with a long term lease. This allows you to purchase properties that already have monthly returns after all expenses! As soon as the offer to purchase is accepted, the search for tenants begins. Our property managers begin aggressively advertising in order to attract the highest number of quality tenants who are then placed into our units. Our newly renovated units attract a lot of attention and they are filled quickly. Our success rate in placing tenants into our units is significant. We use only licensed and insured vendors for repairs and make sure repairs are fixed in a timely and cost-effective manner. We put an end to the middle of the night repair calls. We will relieve you of maintenance worries by coordinating the upkeep of your lawn or pool, as well as preventative maintenance such as pest control. Our property managers will keep your property in working order. Our property management team takes the hassle our of rent collection. rent is collected from tenants and your funds are disbursed to you with an account statement. An annual itemized income and expense statement is also provided. Our team takes care of it all. Depending on how complex of a structure you need to buy US real estate, opening the bank accounts in the US is a headache in itself. We will make sure to get you in touch with bank representatives from various branches and show you ways you can easily transfer money from both sides of the border. Why do need home insurance? Your investment property is one of your most cherished possessions and a large asset. We provide you with qualified insurance brokers with the best rates with low deductibles for insurance on your property. You will obtain the home coverage you need at a rate you can afford quickly and easily without any hassle. This includes getting content insurance and/or liability insurance for asset protection. We will get you in contact with a team that specializes in representing foreign owners of US property before the US Internal Revenue Service (IRS), State and local county taxing authorities get their hands on your money! We will provide you with an education and understanding of US property ownership and tax compliance. Areas of tax compliance of which you should be aware; including US income tax, local and state taxes and licensing, capital gains tax and FAPI & FIRPTA withholding. Auxo Homes has power teams in Atlanta, Las Vegas, Jacksonville, Tampa and Orlando. You will always have access to us and our team, and through active communication between us, our project managers and you, you will be given updates on the property. Need accountants, lawyers, Realtors, property managers, title company, inspections, insurance brokers and contractors? 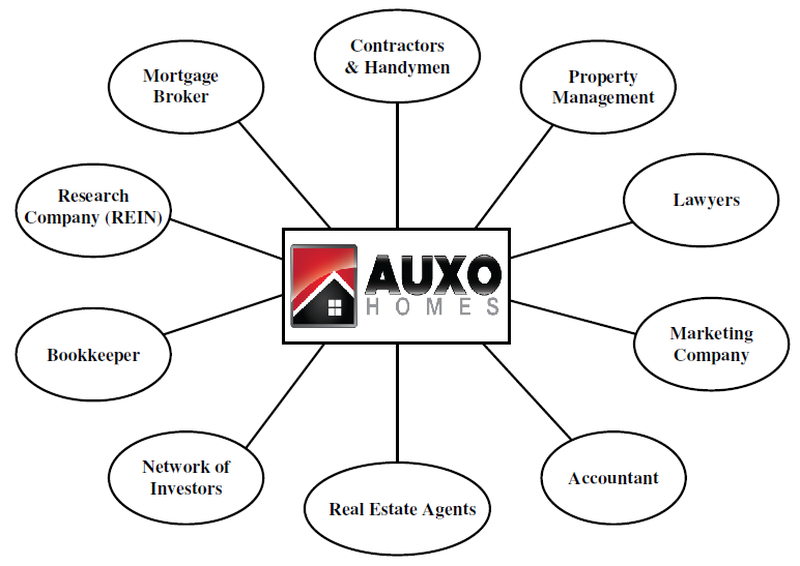 Auxo Homes already has a full team we actively use to bring you the best deals. Need to use one of the team members? Our support package will make sure you have the right people on your team to guide you through the entire process. So the next question is.....Are you ready to become an International Real Estate Investor?!!! We've taken you through all the steps, provided all the tools and support you will ever need, now it's up to you to take action!